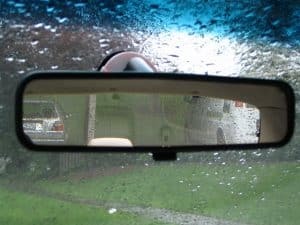 Objects in the side view mirror are closer than they appear because they represent a reflection of a moving object that is no longer in the exact position that the reflection views. If reflected on a convex side view mirror, it will look much smaller than expected, making it seem even further. A convex side view mirror will show you a wider field of view but will compress the reflection and give the illusion of increased distance. A flat mirror may be better suited for a better representation of range, they have a limited field of vision. A common problem with the side view mirrors is that the glue gets old and the mirror will fall off. Luckily, it’s possible to reattach the mirror with the right equipment and skills. In this article, you will find out how you can reattach your side view mirror with glue, and how to adjust it for the best performance afterward. Let’s go! Your side mirror can give you a great view of the different parts of your car. As you drive, you can see the side and back parts of the car, helping to prevent accidents during lane changeovers. Being lifted away from the car, it can be prone to breaking because of vandalism and other factors. Many drivers often find themselves having to take their car to a mechanic for the minor fix while it can easily be repaired. With the right side view mirror glue, you will be able to replace your broken side view mirror. What type of Adhesive Glue should I Use? Aside from this non-latex construction silicone adhesive, you will also need masking tape for sealing, a replacement mirror, and a heat gun. You will probably replace your broken side view mirror away from a source of electricity, so having an extension cord can be helpful. For additional safety, we recommend you work with safety goggles and gloves as side view mirror glue can be harmful if ingested or comes in contact with an exposed eye. You may also need a bucket to trap all the broken pieces of glass that could cause damage to your soles. While wearing protective gear, remove the broken or the worn out mirror from its casing. You should use a large sized flat head screwdriver to scrape out the pieces. You may have to cut it into smaller pieces as this will help you get every piece without breaking the mirror housing. You can also heat the side mirror housing to reduce the hardness of its adhesive and make it easier to remove the pieces. Apply the silicone adhesive on the back of the mirror about half an inch from each tip. Once the glue and mirror are replaced, wipe down around the mirror edge for any overflowing glue with a wet rag. To avoid potentially affecting your glue’s effectiveness, you should not use chemical products when cleaning the mirror. Side mirror glue will take some time to hold. Wrapping it in place with masking tape will prevent the mirror from sliding, and should be removed after 24 hours. If you align your side mirrors wrongly, you will be at a higher risk of a collision. Yearly, a large number of accidents are caused by blind spots, resulting from misaligned side mirrors. You can rectify any misaligned mirrors to get you the best view possible of your sides and back. The inside view mirror is the easiest to set. It should be rather straight-forward but can affect the placement of your side view mirrors if done incorrectly. Your mirror should be centered on your view in such a way that you can clearly view the rear windshield. If this is done improperly, it may affect the settings of your side view mirror and could cause blind spots. Side view mirrors are not quite as specific as the inside mirror because they do not have a fixed guide. You can tilt your side mirror inward, but going too far could limit the line of sight. Going outside of range when placing side mirrors may cause your mirrors to overlap which will also reduce your view. 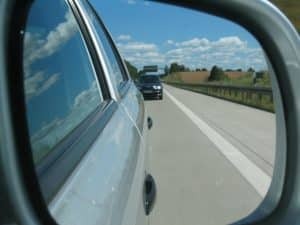 You can find the best angle to place your side mirrors by carrying out a driving test and have two cars approach you from either side. For perfect alignment, you will be able to see the cars in your side view mirrors, as well as seamlessly transition between the side and inside view mirrors. In this setup, your car’s sides will barely be in the line of sight, preventing them from creating blind spots. To get the perfect placement, you will need attention to detail in the execution. This is especially true if your mirrors are broken and have been replaced with side view mirror glue. If you reduce the overlap between the mirrors, you should be able to minimize any risk of blind spots. If your side view mirrors are frosted, using hot water to clear it up may cause the glass to break. Frost could limit the line of sight of your side view mirrors, which might cause blind spots. You should clear it up with rubbing alcohol, mixed with a small amount of water. The low freezing temperatures of the alcohol will help keep the side view mirrors from forming any frost. Finding the best placement for your mirrors will protect you from the risk of having blind spots. You will be able to have an unblocked line of sight, which will make driving safe and fun. If you are replacing your broken side view mirror, you should replace it carefully to avoid distorting the placement angle, which could limit your field of view. Remember to give your side view mirror glue time to dry and settle well. Since you will be working with potentially dangerous equipment, you should remember to wear your protective gear for a risk-free process.